Powerhouse jumbo with astonishing bass that you can also pick. A preconception changer. Incredibly versatile, in both tones and playability. Taylor neck. Great bass. Low-end may need taming when plugged in. Try as we might, it's hard to imagine a future where Taylor would produce a vintage reissue guitar. Never one to rest on its laurels Taylor's revealed an overhauled solid maple back-and-sides 600 Series - all-new for 2015. Maple is very well managed and harvested, meaning a good prognosis for its ongoing use for the backs and sides of acoustic guitars. 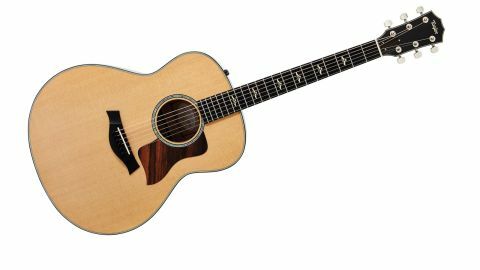 However, maple has a certain reputation in flat-top acoustic guitars that, while loved by many players, is undoubtedly not as popular or well regarded as the more 'classic' mahoganies and rosewoods. "Maple, to me, has a few limitations in the way that we've traditionally used it," says Taylor's chief designer Andy Powers. "It does have some great attributes; it's super-linear, it's really transparent... it's got all these cool things going on for it, but it seems that the most kind thing that guitar players say about a maple flat-top is, 'They amplify well', or 'it's a great stage guitar'. "To me, that's not really fair. In the violin world they've insisted on nothing but maple and spruce for the last, well, 400 years! "I also have all this archtop building experience, and I insist on nothing but maple for that... and with mandolins. It's known as this first-class instrument wood in lots of ways, so in order to make a more gratifying [flat-top] guitar, I needed to change the design and the architecture and some details." Our 618e Grand Orchestra is Taylor's newest and biggest body shape. The first surprise is that the maple back and sides are dark brown-coloured, not the very pale, or indeed brightly coloured hues of Taylor's previous 600 Series. "Taylor rewrote the book on modern acoustic guitar playability... you can engage properly with this guitar, but it never feels like hard work"
Instead, Powers developed a hand-burnished process to apply the colour that adds no measurable thickness to the overall finish. The 'Brown Sugar' hue is visually closer to what you might expect on a violin (albeit underneath Taylor's newest ultra-thin gloss polyester topcoat), and while we weren't expecting it to look like this, there's no doubt it's a stunningly beautiful finish that shows off plenty of the tiger-striped figuring in the timber, without being over-ostentatious or gaudy. The backs and sides are bound tastefully in ebony and figured ivoroid for some extra, understated class, and it's worth mentioning Taylor's superb level of craftsmanship at this point. We've come to take it for granted from the brand, but this guitar is incredibly well made and finished: a blend of precision and consistency, yet with a strong sense of approachability, too. The new 600 Series solid Sitka spruce top is interesting for a couple of reasons: firstly because it uses the latest, model-specific 'Advanced Performance' bracing patterns developed for the 800 Series last year - including the forward-shifted design with relief rout and hot-hide glue construction for better resonance and tone transfer, according to Taylor - and secondly because it's been, er, cooked! Powers explains that he experimented with torrefaction for the top, whereby it goes through a high-temperature process that ages it slightly, but also makes it go a slightly darker hue that, along with the tasteful, striped ebony pickguard, dark ebony bridge and fingerboard, fits perfectly with the understated, classic aesthetic of the whole guitar. Again according to Powers, the torrefaction process is to a 'medium-rare' level to continue the cooking analogy; enough to effectively "put a year or two's playing on them" in terms of ageing, but not so much to overdo it tonally and produce a much darker, more homogenous colour. "That would be well done," he laughs. We also like the grained ivoroid wing-like fingerboard inlays, echoed on the back of the headstock, which is faced front and back with glossed ebony: again, tremendously classy. There's not much to say about the Taylor neck that hasn't already been said; a superbly inviting blend of grown-up acoustic playability in terms of string spacing and nut width, and the very subtlest of hints of V in the profile towards the lower frets, in this case made from maple and with a tinted satin finish to match the back and sides. Taylor rewrote the book on modern acoustic guitar playability, which might suggest it's too slinky or aimed too much at beginners. Not a bit of it - you can still engage properly with this guitar, but it never feels like hard work. It's joined to the body with Taylor's proprietary NT bolted/shimmed/pocket design, while the headstock and heel are scarfed on. A set of nickel tuners, ebony bridge pins and Taylor's elegant ES-2 electronics package rounds things out. The 618e has the biggest, strongest, clearest bass of any 'normal' acoustic guitar we've played in recent memory: it's absolutely colossal, rendered all the more surprising as it's not to the total detriment of the midrange or top-end strength. Clearly, the combination of the Grand Orchestra's cavernous body, the particular sonic character of the maple, and of course the all-important bracing, has produced a preconception-changing instrument here. "Taylor doesn't have the vintage cross to bear, so is 'free' to evolve carefully but consistently"
Your eyes say 'jumbo' but your hands, brain and ears compute something new and unique; pick it, strum it, flatpick it - it's a genuine all-rounder, despite the size. It has something of maple's brightness and zing about it - it would be a real shame if it didn't - but there's no doubt that it's a vastly different experience compared with a Gibson J-200, to cite a very famous example. Plugged in, the ES-2 electronics package provides a very different ride from the original Expression System. Gone are the body sensors and the pickup in the neck pocket, replaced with three adjustable pickup sensors mounted in the bridge, behind the saddle, not underneath it. The sound is closer to what you might expect from an under-saddle pickup (where the original Expression System is vastly different), with a good, healthy output for your amp or PA. Despite the ostensibly simple controls (bass, treble and volume), the way they interact means you can coax a wide range of sounds from the guitar. Do you want a parametric mid in the guitar? We don't - it's much better to keep the guitar clean and classy and do that kind of tone shaping via an external box or mixing desk, if indeed you need it at all. The colossal bottom end of the 618e needs some taming when plugged in - it will howl into body resonance feedback very easily, as you'd expect of such a big guitar. The internal phase switch helps a great deal - a superb inclusion on any electro-acoustic system - but there's obviously a point when the laws of nature take over. Nevertheless, we'd be happy to gig this guitar with absolute confidence. We're often quick to point out that the guitar world moves slowly, with little real 'progress'. When it does move, however, players are quickly cynical; it's a cul-de-sac (albeit a popular and profitable one) in which the famous heritage brands have found themselves for many years. Taylor doesn't have the vintage cross to bear, so is 'free' to evolve carefully but consistently, something it has done with great judgement, over the last decade especially. Just like last year's 800 Series update, then, the new 600 Series instruments will surprise and educate in equal measure and do indeed offer a new way to consider maple as a serious alternative to the all-conquering rosewoods and mahoganies of the acoustic world. The 2015 618e, is simply a storming guitar; a preconception-changing, powerhouse jumbo that you can strum or pick with confidence. It's every bit a modern classic and demands an audition, even if it's only to say that you've played one.